# 26 in our Waikiki map. Hotel Name: .... Halekulani Hotel. Address: ......... 2199 Kalia Road. 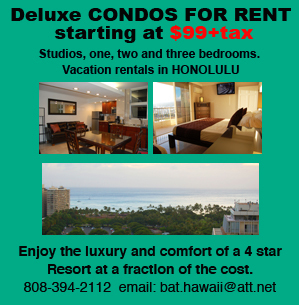 This is the only hotel rated 5 stars on and off over the years on the Island of Oahu. 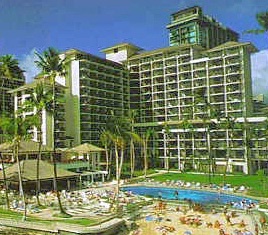 Like many traditional Waikiki Hotels, the original construction started many years ago with parts of the property developed as far back as 1920. The latest part of the development however was opened for business in 1984 and has remained unchanged ever since albeit with the logical continuous maintenance and renovation required in a property of this category. This hotel is number "26" within the red zone of our waikiki map, click here to see it's location in relation to other hotels in Waikiki. It is without a doubt one of the Waikiki Hotels that has the best service, from the Hotel operation to the restaurants and the stores. It is one of the few hotels located actually ON Kuhio beach (better known as Waikiki beach) and it is in a very desirable central location. The beach in front of this hotel is almost non existent (no sand) so for many, paying for a "beachfront property" that has almost no beach in front of it it's a disappointment. Some travelers feel that the parcel is a little overbuilt, it is as if they expect to have more open space.